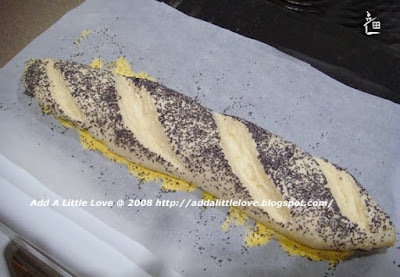 This is my first trying to make French bread. 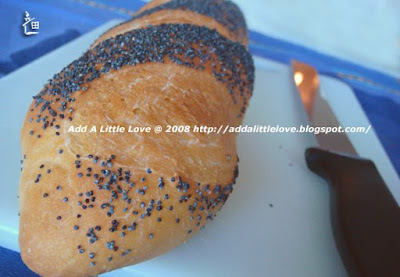 It turned out fine, and looked very like French bread. In terms of the taste, there is still room to improve. 1. Dissolve yeast in warm water, let it sit for 5 minutes. 2. Mixing all ingredients, except butter. 3. knead the dough for 10 minutes. 4. Add butter and knead the dough until it is well blended with butter. 5. Cover the dough and let it sit in a warm place for an hour or until it doubles its size. 6. Cut the dough into half, and knead the each dough into round shape. 7. Let the round shape dough sit for 15 minutes in a warm place. 8. Turn dough onto a floured surface and press the dough into a flat round shape. Then roll into two long loaves and place on cookie sheet seam side down. 9. 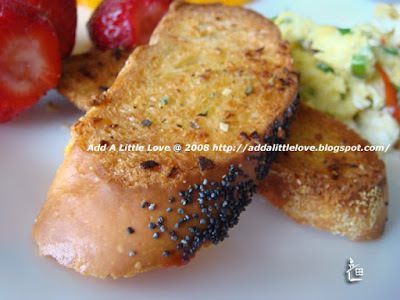 Sprinkle the poppy seed on the top. 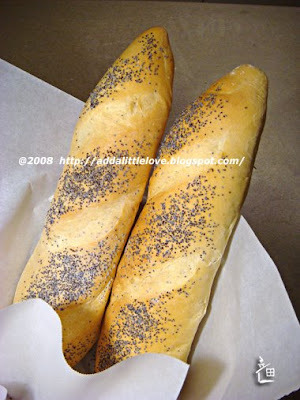 (or parsley, cheese of your choice) Using a sharp knife, make 3 diagonal slashes along the top of each loaf. Cover with towel and let rise again until doubled. 10.Place in pre-heated 400 degree oven. Bake for approximately 30 minutes.